​Pentheus was a king of Thebes in Greek mythology, a grandson of Cadmus, Pentheus was considered an arrogant king, and ultimately paid the price for denying the divinity of the god Dionysus. Pentheus was the son of Echion, the leader of the Spartoi, and Agave, the daughter of Cadmus and Harmonia; making Pentheus grandson of Cadmus. Pentheus also had one sister, Epirus. With the story of Pentheus it is important to understand the family line of Cadmus. Cadmus and Harmonia had four daughters, Agave, Autonoe, Ino and Semele, and two sons, Polydorus and Illyrius (although Illyrius was born after the tale of Pentheus). Agave would become mother of Pentheus, Autonoe became mother of Actaeon, Ino became wife of Athamas, and Semele, importantly, became a lover of Zeus and mother of Dionysus. ​When Cadmus was of advanced age, he abdicated the throne of Cadmea, as Thebes was then known, and Pentheus was chosen to succeed him. Now as to why Pentheus, the grandson of Cadmus, was chosen in preference to Polydorus, the son of Cadmus, is not entirely clear, perhaps Polydorus was not yet of age, or perhaps it was simply that Pentheus was in greater favour with Cadmus. ​When Pentheus was king Dionysus returned from his travels around Asia, and because Thebes has been the city of his mother, Dionysus decided to bless Thebes, by introducing viniculture, and then have the populace of Thebes initiated into his sacred rites. Before Dionysus came to Thebes though, his aunts had spread a tale that Dionysus was simply a son born to Semele by a commoner, and a son born out of wedlock on top of that. Thus, on his arrival in Thebes, decided to punish his aunts, and other women of Thebes, thus he had the women transformed into a state of frenzy, whereupon the women left their homes, and took up residence upon Mount Cithaeron. Dionysus decided that the transformation would not be lifted until they acknowledged his divinity. Pentheus seemingly believed in the words of his mother and aunts before their transformation in Maenads, and believed that his cousin, Dionysus, was a mortal man, and a mortal man who was having a corrupting influence on all the women of Thebes. There were those in Thebes who sought to persuade Pentheus that he was mistaken, including Cadmus, and the seer Tiresias, but Pentheus refused to listen to their wisdom. In addition to denying the divinity of Dionysus, Pentheus also started to crack down on the god’s followers, having those perceived as followers arrested. Thus it was that royal guards arrested Dionysus, thinking him to be just a follower and not a god, annoyed by his very appearance, Pentheus had Dionysus chained up and thrown into jail. No mortal crafted chains could hold a god though, and Dionysus freed himself from his imprisonment, then the Greek god of wine razed Pentheus’ palace to the ground. Pentheus also had other problems as well, for the armed guards sent to arrest the Maenads, the female followers of Dionysus, were being bested by the women. Imbued with enormous strength, these Maenads were ripping limbs from the guards. ​Having razed Pentheus’ palace to the ground, Dionysus now planned further punishment for his cousin, and so Pentheus, who was intrigued about how the Maenads were besting his men, was enticed to spy on the activities of the Maenads. Dionysus, who was disguised as a priest, convinced Pentheus to go to woods on Mount Cithaeron, but warned the king of Thebes that he must be disguised as a woman, or else he would be immediately killed. 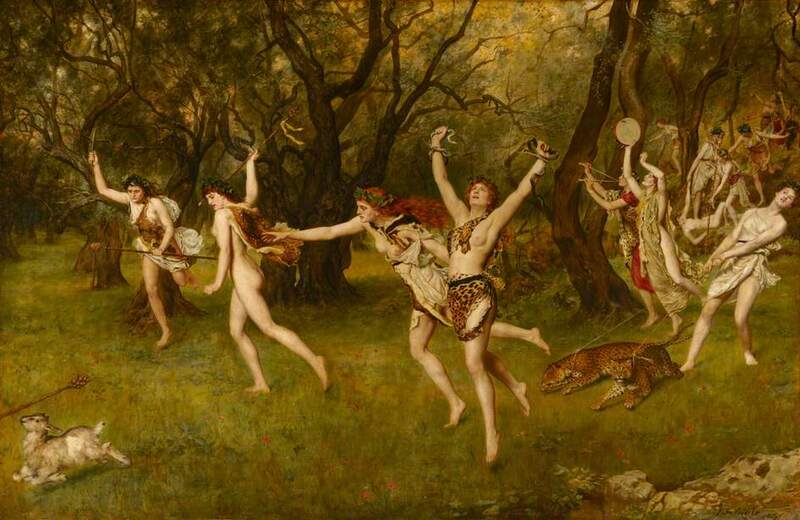 Pentheus would subsequently climb a tree to gain a better view of the Maenads, but his presence was then revealed to the female followers of Dionysus by the god. Still in a state of frenzy, Agave, Pentheus’ mother, saw not her son in the tree but a wild animal, and she and her sisters dragged Pentheus from his hiding place. Pentheus’ mother and aunts then tore limb from limb, and Agave even placed her son’s head on a spike, believing it to be a head of a lion. Dionysus then caused the madness of the frenzy to leave Agave and her sisters, and they realised that they had killed Pentheus. When they daughters of Cadmus returned to Thebes, they were promptly expelled for the crimes of regicide and the killing of their own family member. ​The body of Pentheus, or its remnants, subsequently left Thebes, for it was carried away by his sister, Epirus, when she left, in the company of Cadmus and Harmonia. The throne of Pentheus, then passed to Polydorus, his own uncle and the son of Cadmus. The family line of Pentheus potentially continued though, for it was said that Pentheus had a son, Menoeceus, by an unnamed woman. Menoeceus subsequently had his own children, Creon and Jocasta.